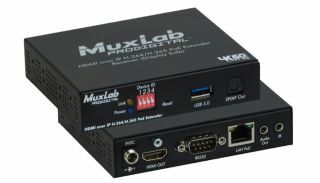 The What: MuxLab has introduced its HDMI-over-IP H.264/H.265 PoE Extender system, which provides two methods of delivering AV content with support for 4K imagery. This new extender works with both IP-based infrastructures and Cat-X cables, supplying new and traditional methods of AV signal delivery in one solution. It allows computers, mobile devices, and AV sources to be connected to a remote display or TV with a nearly instantaneous delivery of 4K at 60Hz quality video with less than 300ms latency. The What Else: When riding on an IP-based architecture, transmitters and receivers connect AV sources to displays at local or remote distances via an Ethernet switch. Nearly unlimited sources and displays are supported in this system, depending on network bandwidth. Every source is accessible from any display, allowing point-to-multipoint and multipoint-to-multipoint configurations. Because of its low bandwidth requirements, this extender can stream AV content over a local network, Wi-Fi, and the internet, reaching nearly any location around the world. The system operates in a flexible and expandable manner, enabling virtual switching and signal extension without dedicated cabling. Alternatively, transmitter and receiver can connect an AV source to its display up to 100m (330 feet) in distance via one Cat-5/6 cable. Integrators can include AV devices with a maximum resolution of 1080p at 60Hz in the system, which will be up-scaled to 4K at 60Hz on the output for higher resolution. H.264/H.265 video streams are accepted, allowing AV content to better stream on a LAN, Wi-Fi, or internet infrastructure. Users can also connect a USB drive to the system for local playback and storage of content. PoE is supported, eliminating separate power requirements for both transmitters and receivers. The form factor of this system is designed to be compact and unobtrusive. Each receiver provides one digital SPDIF (TosLink) audio out. A two-channel audio insert is supported on the transmitter and a two channel audio extract on the receiver. For remote control, RS-232 and bi-directional IR is supplied.